In 1901, Congress passed legislation to appropriate funds for the Architect of the Capitol (AOC) to submit plans for reconstructing the center of the U.S. Capitol, a project that included refacing the West Front in marble. 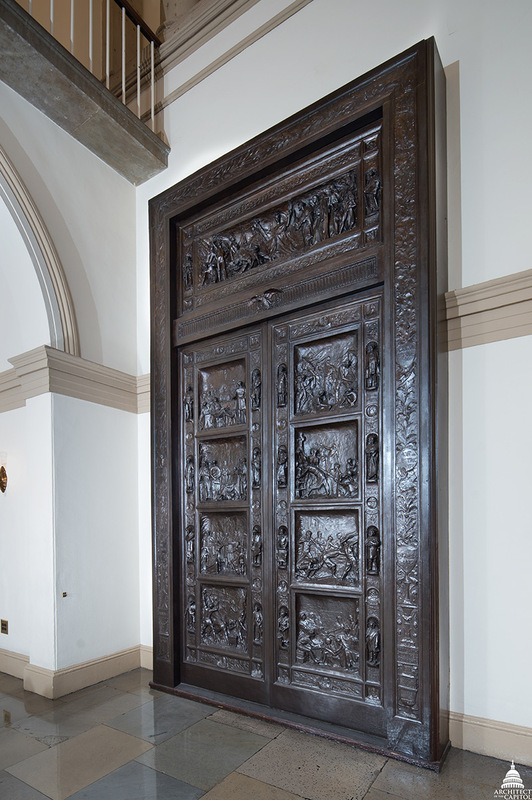 As plans were being developed, Superintendent of the U.S. Capitol and Grounds Elliott Woods began working with sculptor Louis Amateis to design a set of magnificent bronze doors for the new façade that would be comparable to those at the entrances of the East Front. Initially, the pair wanted to portray a series of historical scenes on the doors, but further research persuaded Amateis that the West Front doors would be too narrow for displaying anything so complex. After developing several drawings and models, they selected final subjects that represented more general themes, such as the arts, science and agriculture. The completed Amateis Doors in the U.S. Capitol. The doors, initially called the "Apotheosis of America," were cast in 1910. However, legislation for the improvement of the West Front had not been authorized, so a specific location for the doors was never identified — perhaps a contributing factor to their fate. 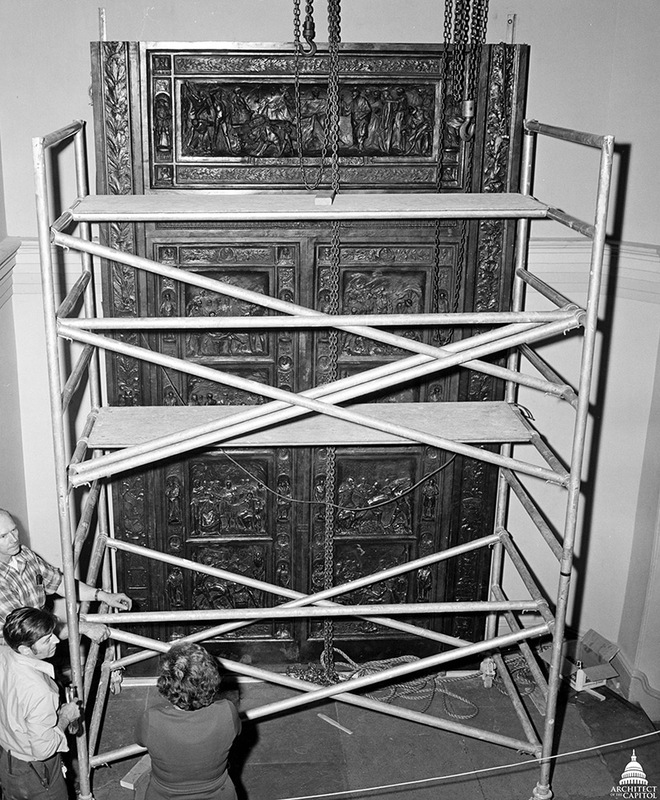 The Amateis Doors, as they became known, were lent for display to the Corcoran Gallery of Art from 1910 to 1914 and the Smithsonian Museum of Natural History from 1914 to 1967. The doors were then returned to the AOC and placed in storage until a suitable location was identified. 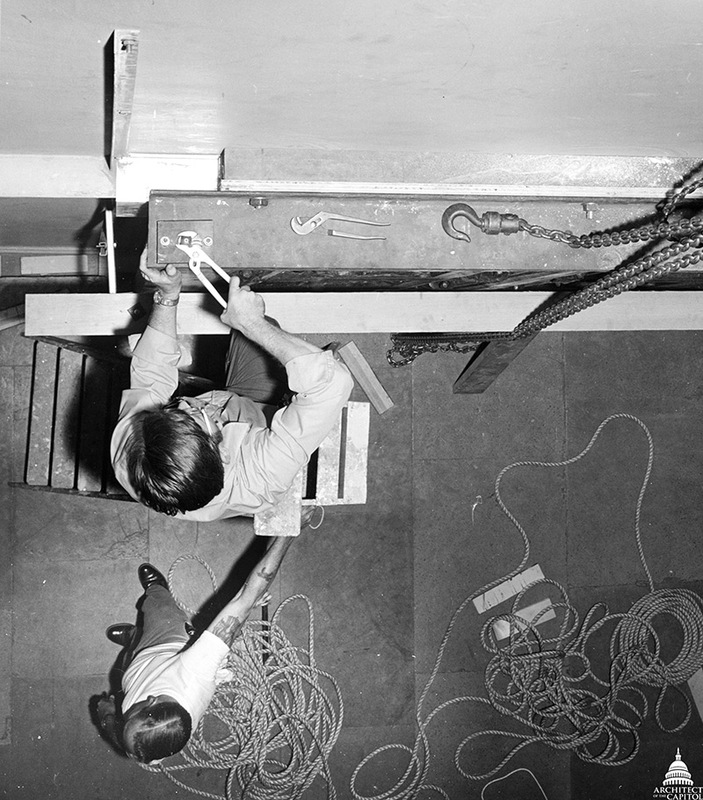 AOC employees, seen here in 1972, installing the Amateis Doors in the U.S. Capitol. 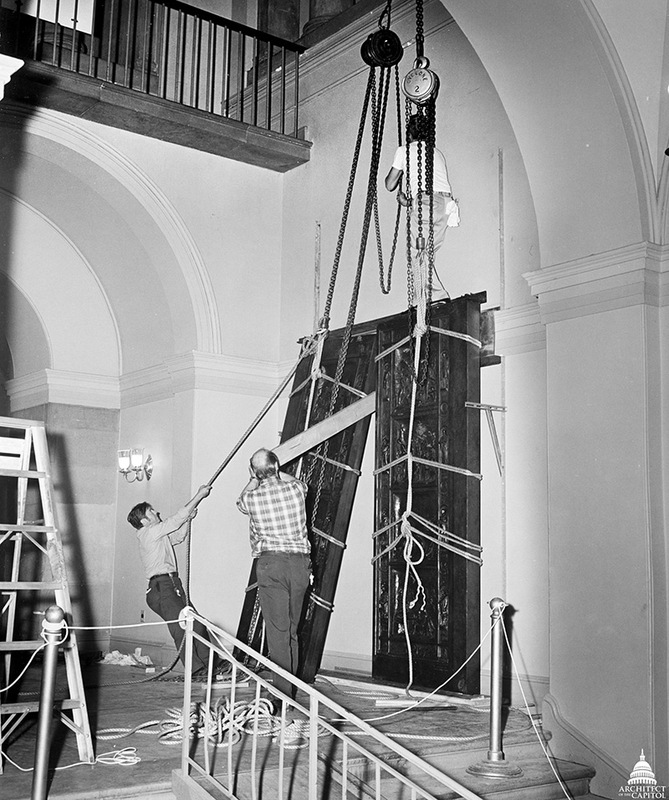 In 1972, AOC employees spent days cleaning and installing the 800-pound doors in the U.S. Capitol near the Crypt, where they continue to hang today. The doors may not open to the West Front or have a view of the National Mall, but their prominent display just down the stairs from the Rotunda allows millions of visitors to stop — uninterrupted by humidity, wind or rain — and admire their intricate details of our nation's great history. Interesting story. Thank you, Erin.